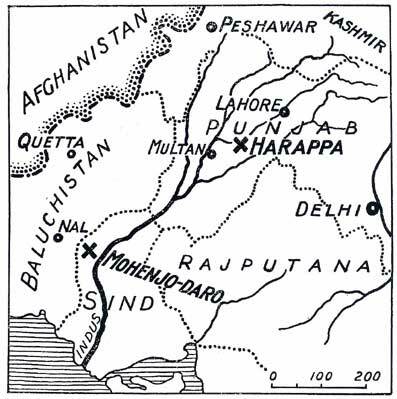 Map to show where the Archaic sites were actually discovered in 1924, at Harappa in the Punjab and at Mohenjo-Daro in Sind. The writers argument in 1922 was that the archaeological remains found at Nal were certainly inspired by Elam contemporaneously with the manufacture of Susian pottery (circa 3000 B.C. ), and further that it was inconceivable a diffusion from the west as far as Nal could have failed to reach the Indus. Moreover, it was also argued that the intensive search for gold could not have failed (at the same time) to have brought culture-bearers to the Punjab.